The other day I was browsig some electronics sites and stumbled upon the Microchip 11A160 EEPROM. I was kind of intrigued by the idea of having 2kB (16kbit) in a transistor looking TO-92 package so since they were only about $0.30 a piece I grabbed a few. The protocol to read/write data from these is called UNI/O and is pretty easy to implement. Not sure what I'll ever use these things for, but it was pretty fun writing code to talk to it :). I did the communication to chip similar to a previous Dallas 1-wire project. I basically have an interrupt that counts r15 upward every 100 cpu clocks. 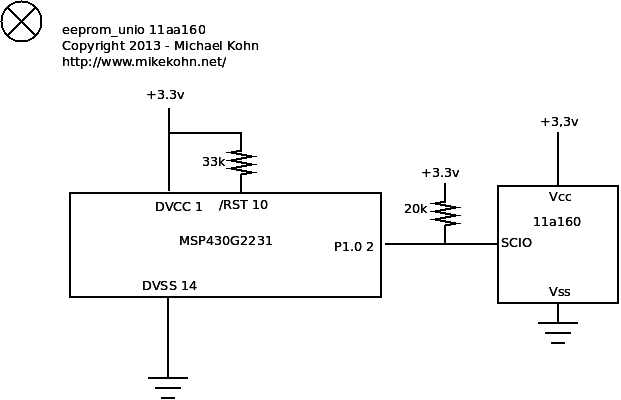 The 11AA160 can communicate between 10kHz to 100kHz which at ~16MHz comes out to 160 to 1600 cpu cycles per bit. I decided to run at a speed approximately in the middle of the upper and lower bound of speed, so in my case every bit of data is 800 cycles or 8 interrupts. The wait_off / wait_on code in my source code demonstrates how I delay for 1 bit. I think the rest of the code just follows what the datasheet says. Feel free to email me with any questions. The code runs on an MSP430G2231 and the source code below can be assembled with naken_asm.